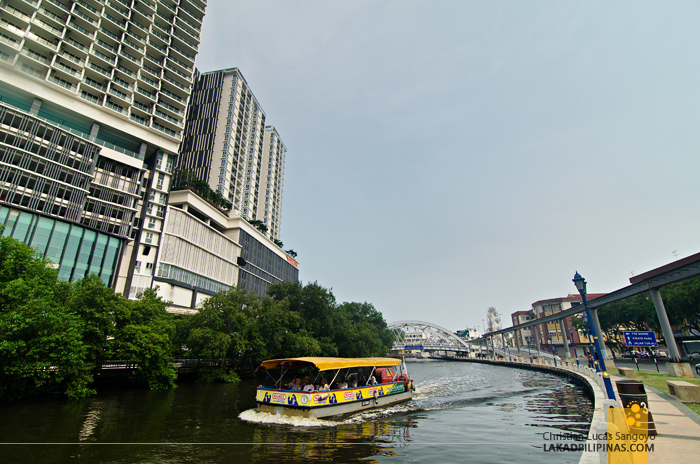 A year ago, I’ve explored the stretch of Melaka River, not from its elevated concrete banks, but right from its midst. Boarding the popular Melaka River Cruise on the first evening we arrived in the city, I saw how vibrant the riverside was. 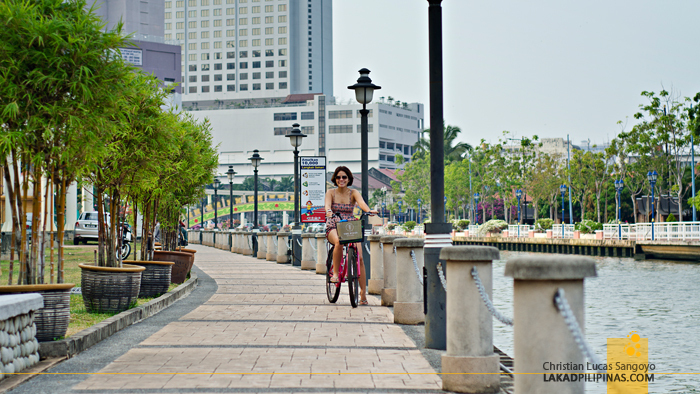 And although the cruise was enchanting, passing glittering buildings from the comfort of our boat, I wished I could savor all its sights on a more leisurely fashion;I wanted to explore it on foot, or on a bicycle perhaps. But we simply didn’t have the luxury of time back then. 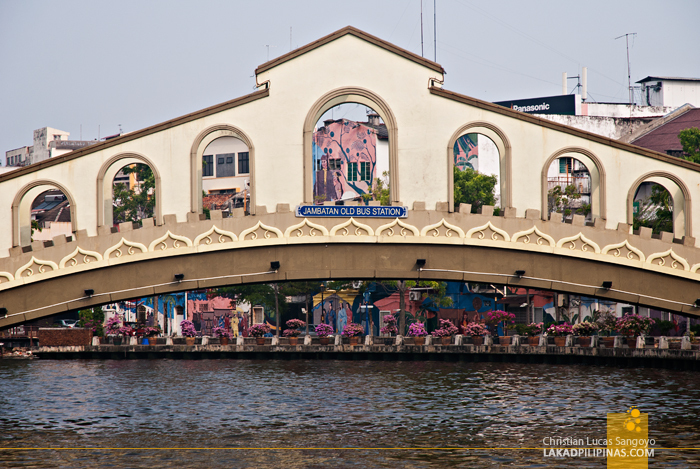 As we came back to Melaka, we promised ourselves that we would take the time to really explore the riverside of this UNESCO World Heritage City. And so it was that on our third day, we set off from The Pines Melaka, our hotel which was conveniently located right beside the waterways, and walk all the way to the Melaka Dutch Square. We timed our jaunt a few hours just before sunset. The heat in the city was simply unbearable for us to enjoy our walk should we have gone earlier. 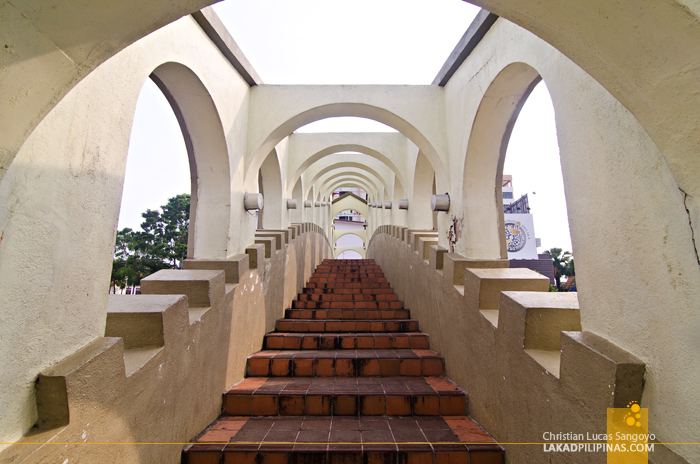 We were advised that the best time to go was either during the early mornings or the late afternoons. We were too lazy to wake up very early, so the afternoon it was. With the sun already on a low angle, the beautifully paved pathways bordered by well-manicured potted plants along the water were already shaded from its harsh rays. 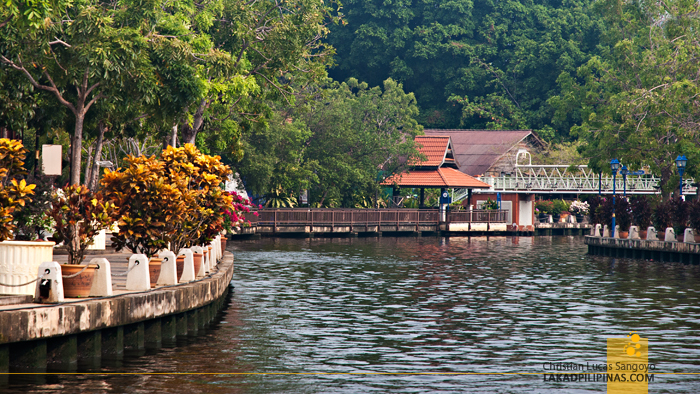 We took our time, leisurely taking in the view on our two slow feet, stopping every now and then to take some photos and wave at the passing tourist ferries. 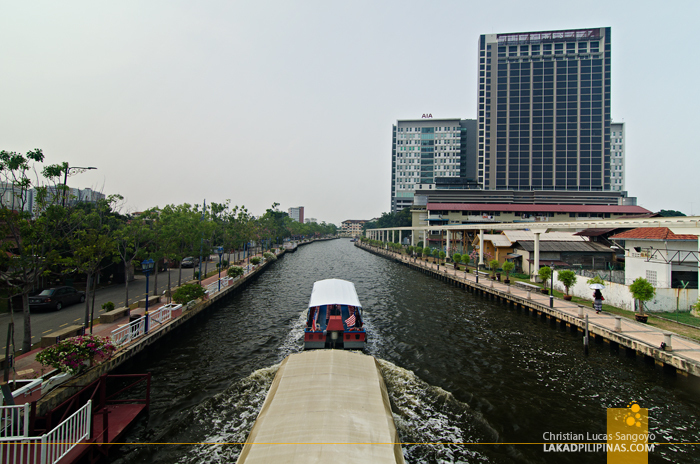 With an average width of 25 meters (a guestimate), Melaka River isn’t that wide. 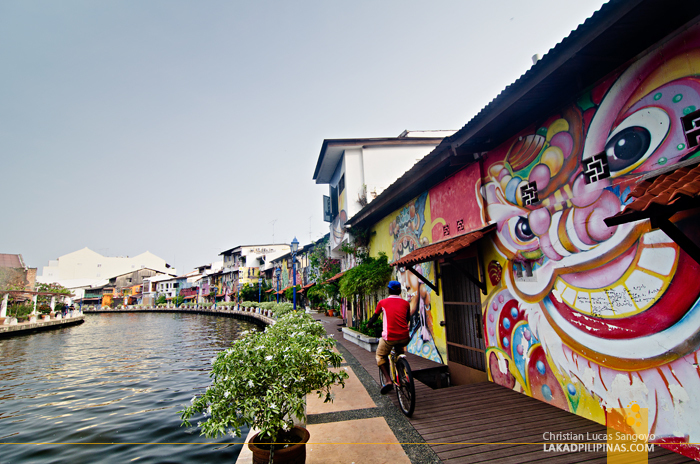 One might even suppose that it might not even be a natural waterway, but rather a canal dug by the Dutch during their time in Melaka. But we were told by a friend who resides in the city that it is indeed a real river, it only looks man-made due to its well-maintained concrete banks. 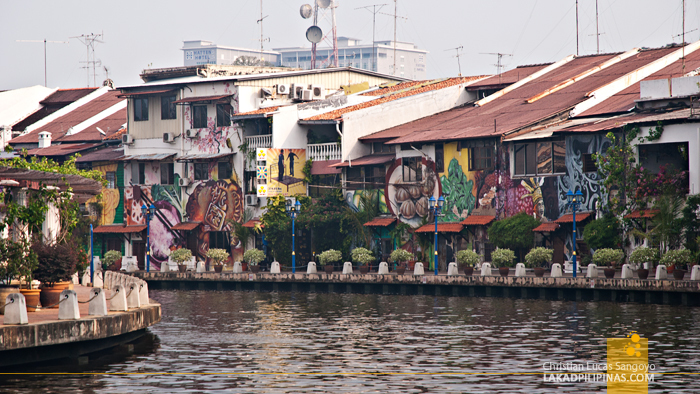 The river is so narrow that several foot bridges span the length of the waterways, most of these, cutesy types complete with arches and dangling greeneries; everything illuminated by kitschy neon lights during the evenings. We crossed a few, taking a few minutes at the center to watch the passing boats, before traversing over the other side. From our walk, we could see that commercial development has already urbanized what was probably once an idyllic haunt. 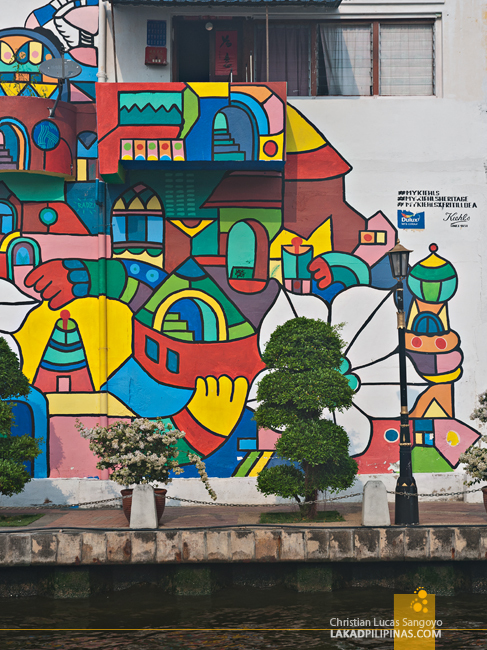 But even so, the riverside was still quite charming; my favorite area being the Sentosa Village, an area set with traditional one-storey orange-roofed Malaysian houses and the graffiti-filled buildings we frequently passed by. Surprisingly, it didn’t take long before we spotted the maroon-colored clock tower along the Dutch Square. 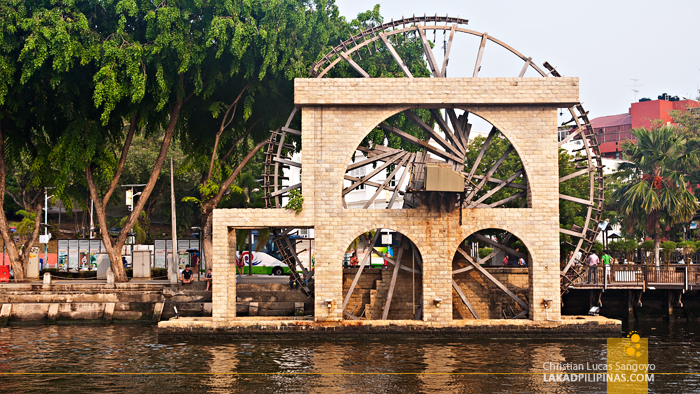 We passed by several al fresco café, passed under the famous Jonker Walk bridge and onto Melaka’s water wheel before deciding to finally turn back. The sun had fully retired and the sky was already painted in hues of electric blue as we sat ourselves down on a table set right by the banks. 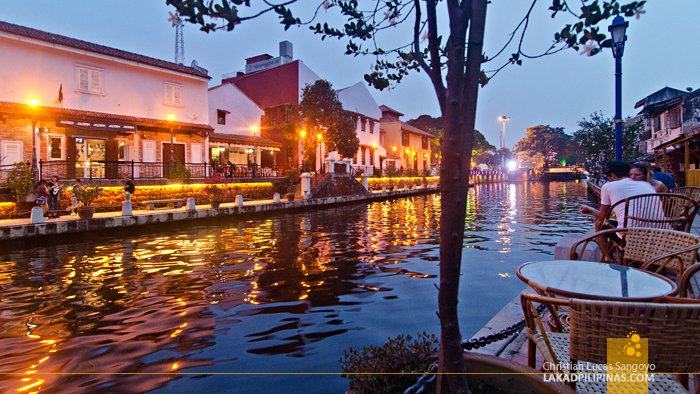 We ordered a bottle of Anchor Beer, swallowing its expensive price and all just to drink beer by the water as we so wanted to from our first visit, and watched the twilight deepen into the early evening right by the Melaka River.